VMMC SJH Recruitment 2019 - Walk in for Lab Technician Post on a project entitled “National programme on Containment of Antimicrobial Resistance” in Department of Microbiology, VMMC SJH, New Delhi on Contract Basis. Candidates are invited by Vardhman Mahavir Medical College & Safdarjung Hospital to attend walk-in-interview to be held on 26 Apr 2019 for 1 vacancy. B.Sc in Biological Science/ M.Sc. in Medical Microbiology/ Diploma in Lab. Technician (DMLT)/ MLT with experience of working in microbiology laboratory for 2 years or more. Eligible candidates may appear for interview along with duly filled application form in the prescribed format (attached below) and self-attested copies along with original, self-attested copies, two passport size photographs, and original documents for verification. VMMC SJH Recruitment 2019 - Walk in for SRF Post on a project entitled “Functionality of B cells in Dengue and Chikungunya co-infections” in Department of Microbiology, VMMC SJH, New Delhi on Contract Basis. Candidates are invited by Vardhman Mahavir Medical College & Safdarjung Hospital to attend walk-in-interview to be held on 26 Apr 2019 for 1 vacancy. 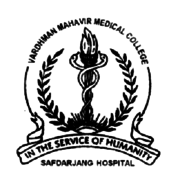 VMMC SJH Recruitment 2019 - Walk in for Sports Psychologist Post in VMMC SJH, New Delhi. Candidates are invited by Vardhman Mahavir Medical College & Safdarjung Hospital to attend walk-in-interview to be held on 26 Apr 2019 10:00 AM for 1 vacancy.